Preconceived notions are ridiculously hard to change – especially ones that pack seriously profitability for some of our nations’ most powerful industries. This is why, despite modern research showing otherwise, saturated fat is still seen as the hooligan causing all the trouble in our disease-ridden culture. Hearing some of the reversal in trends, many people are now searching to figure out if saturated fat isn’t bad for you. And if that’s you, I’ve got some special news. 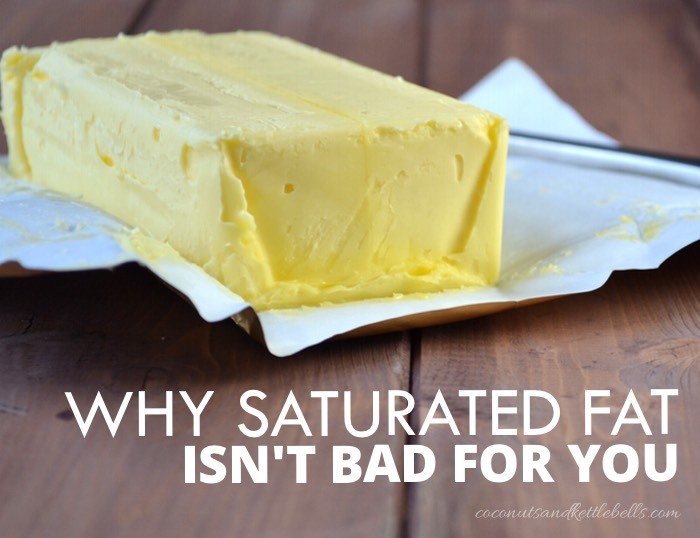 Not only is real saturated fat not bad for you, it also plays a vital role in the 60-90 trillion cells in your body, including those that make up your brain, bones and yes, even your heart. Ancel Keys, a well-known American scientist, saw these flaws and concluded that cholesterol was irrelevant to heart disease, and instead hypothesized that saturated fat was responsible (the diet-heart hypothesis.) 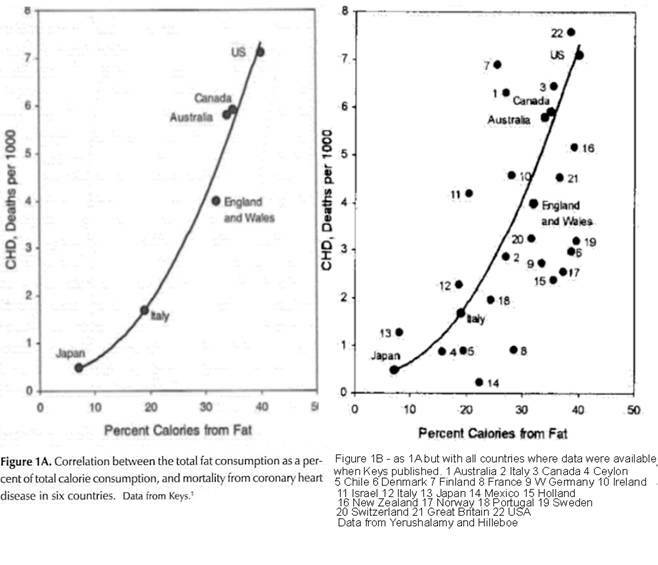 So, in 1957, Keys began a large-scale study called Seven Countries Study which looked at the correlation between deaths from heart disease, and the dietary fat available for consumption in various countries. 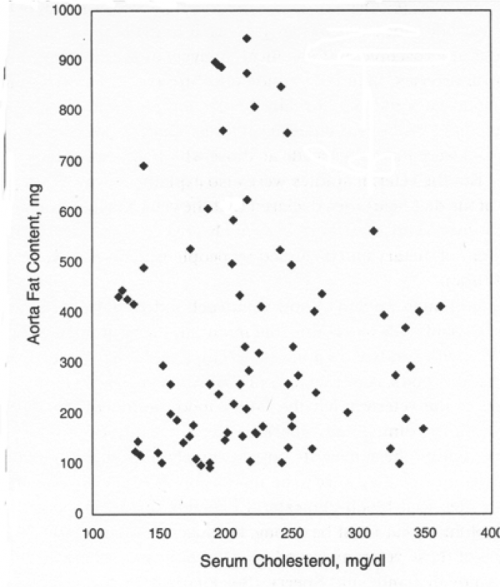 Although the seven countries provided showed a near-perfect correlation between available fat (and correlatively saturated fat) and heart disease (left graph), it was the source of much criticism because Keys had cherry-picked specific countries from a previous analysis published in 1955 (right graph) and didn’t include any that didn’t go along with his theory. Keys was ridiculed by colleagues for the many weakness of his study, and the big guys of the American Heart Association said “more research” was needed. 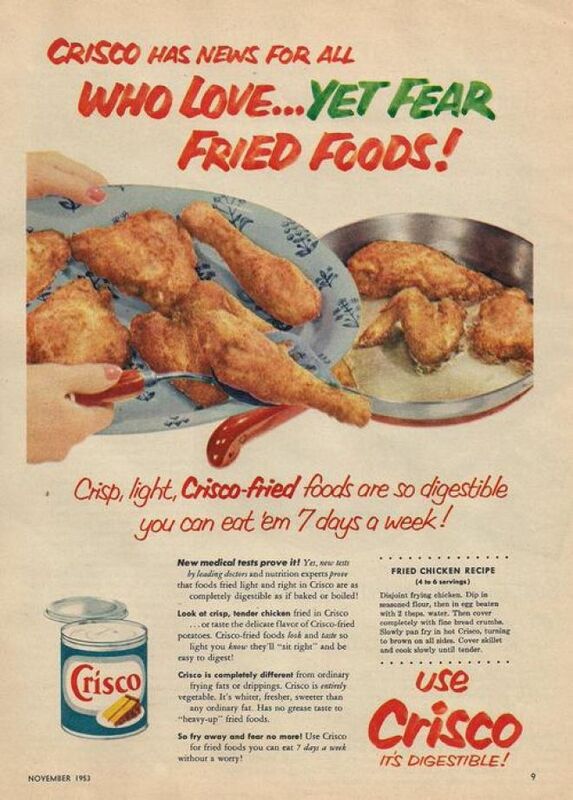 Meanwhile back at the food tycoon ranch, a revolutionary product called Crisco was taking off in the marketplace thanks to the newly-discovered process of hydrogenation. This creamy, white shortening made out of a previously “worthless” by-product of cotton ginning was aggressively marketed by Protor & Gamble as “easier on digestion, more economical, and better for you than butter” without any research or regulation. By 1957, the AHA had grown in power and launched a national advertising campaign in support of the lipid hypothesis and a diet known as the prudent diet in which corn oil, margarine and cold breakfast cereals were promoted over butter, eggs and beef. They also initiated the Anti-Coronary Club, a study which concluded the prudent diet successfully lowered serum cholesterol levels in comparison to those who ate a diet of eggs and beef, which would subsequently “reduce risk” of heart disease. They didn’t mention, however, that lowering cholesterol levels wasn’t proven to lower risk of heart disease, or that the prudent diet group had 8 deaths from heart disease, and the “higher” serum cholesterol group had none. 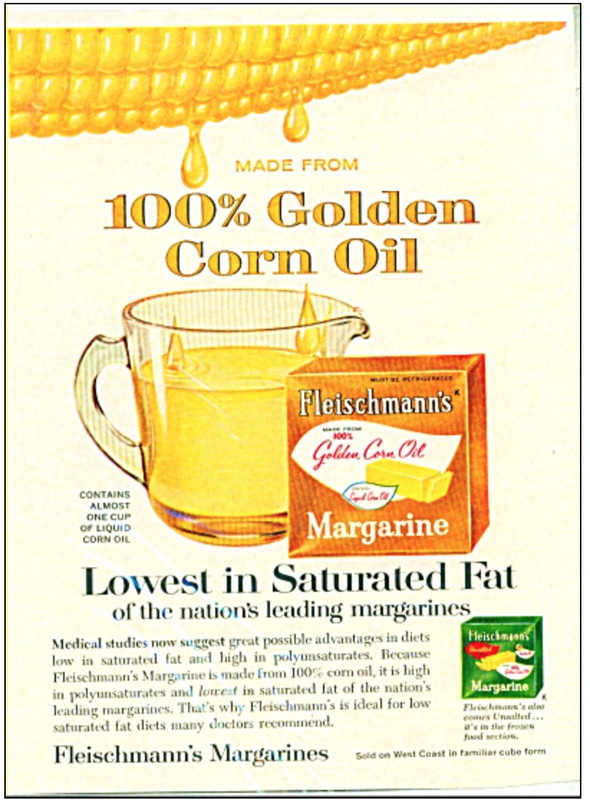 Right on cue – massive advertising campaigns labeling vegetable oils, shortenings and margarines “for your heart’s sake” immediately took over the marketplace. Keys – remember him? The one who the AHA said needed to go back to the drawing board? In 1961, with an unknown “swift” change of heart, the AHA spit and shook hands with Keys, adopted his diet-heart hypothesis, and brought him on as a board member. Around this time, the ISEO also began proactive “supervision” of the AHA and the American Dietetic Association (ADA) which included big pay-outs and “exchanges” of key positions between leaders within the edible oils industry and each association. In the next decade, some major studies, including the 40-year Frammingham Study, and the Multiple Risk Factor Intervention Trial were produced with the backing of the AHA and the edible oils industry to support the lipid/diet-heart theory, most of which are still referenced as “proof” of the cause of heart disease to this day. Unfortunately, the “findings” of these studies were later found to be greatly flawed when put under the microscope for inaccurate manipulation of data. the more saturated fat one ate, the more cholesterol one ate, the more calories one ate, the lower people’s serum cholesterol… (and) we found that the people who ate the most cholesterol, ate the most saturated fat, ate the most calories weighed the least and were the most physically active. Despite vigorous efforts to keep trans fats labeled “good for your heart” and the lipid hypothesis as dogma, a number of brilliant “renegade” doctors and scientists put their careers on the line throughout the 1990s to conduct independent research about what they called the “diet-heart scam.” Perhaps one of the most outspoken of those, Dr. George Mann, formerly with Framingham study, footed the bill for independent research and concluded the lipid hypothesis was “the greatest scam in the history of medicine.” These researchers made waves, but it wasn’t until 1995 that the dangerous of trans fat were publicly recognized thanks to the work of European researchers. 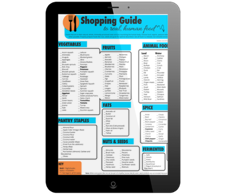 The final “one-two” punch came in 1992 with the launch of the US Department of Agriculture’s Food Guide Pyramid which was built by policy makers with the purpose of profiting the food industry. Dr. Luis Light, former USDA top-level nutritionist who was tasked with developing the food guide pyramid recounts that after years of research, her team was shocked when the finalized version of the pyramid came back to them virtually “flipped.” Instead of vegetables and fruit being at the base, words like “fresh” and “whole” were removed and processed grain products were put at the bottom with a whopping 6-10 recommended servings per day. Perhaps the biggest pitfall? All sources of fat were lumped together and recommended to be used sparingly as if they had no healthful purpose in the body. Whew, welcome back. Before we cream this all together and decide if saturated fat is good or bad for you, let’s take a quite look at the stats of our modern day. Today, the average American consumes over 70 pounds of vegetable oils and 156 pounds of sugar per year. Egg consumption continues to fall, while the use of traditional fats like butter and lard are kept at a minimal 6 pounds per year combined. Despite massive advancements in medicine, 7 out of 10 deaths in America are caused by chronic diseases including heart attack, stroke and cancer. To add to that, over 70% of Americans are overweight, and 35% are obese. 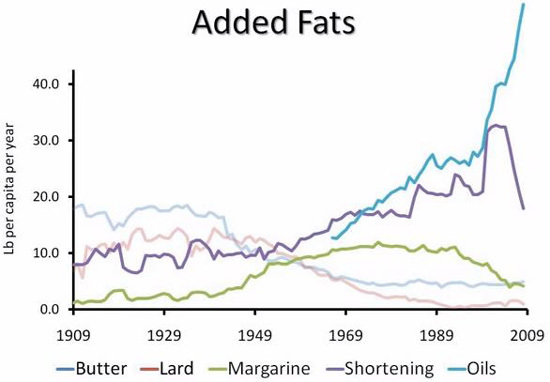 In 1900, while still excessive, Americans ate only 90 pounds of sugar a year, and consumed 18 pounds of butter per year along with good amounts of tallow and lard as vegetable oils were non-existent. Heart disease and cancer accounted for 18% of deaths, and less than 1% of the population was obese. Let’s explore what we know about cholesterol, saturated fat, and heart disease today – and see if we can find the answer to whether saturated fat is good or bad for you. There’s no connection whatsoever between the cholesterol in food and cholesterol in the blood. And we’ve known that all along. Cholesterol in the diet doesn’t matter at all unless you happen to be a chicken or a rabbit. Arteriosclerosis has no relationship to blood cholesterol level. Cholesterol deposition occurs in arteriosclerotic lesions regardless of how low the blood cholesterol level is, and it does not deposit in healthy vessels regardless of how high the cholesterol level is. This explains the seeming paradox of why some people with low cholesterol suffer heart attacks and some people with high cholesterol do not. OK… focus. This is the good stuff. To wrap this all together, while it’s been observed that high cholesterol in the blood is correlated with a slightly higher risk of experiencing a heart attack, it doesn’t mean high cholesterol is the cause of heart attacks. If this were true, a reduction of cholesterol levels by any means would reduce your risk, which has been proven again and again to be untrue. In fact, more than 40 trials have shown that just as many people die in treatment groups who have had their cholesterol levels lowered in comparison to those who have had no treatment given. To top it off, statin drugs, which prevent your body from making cholesterol have been shown to have no benefit for those with “high” cholesterol and no signs of heart disease. Let me put it this way. Just because ice cream consumption and death from drownings increase correlatively in the month of July does not mean ice cream consumption causes drownings. Instead, both increase as a result of another factor – the rising temperature. Did the lightbulb just come on? Perhaps some of the most compelling research is revealing what many “renegade” scientists warned about all along: low cholesterol is associated with higher rates of overall chronic disease and death. Specifically, low cholesterol levels (under 160mg/dl) are associated with higher rates of death when compared to those who have “high” cholesterol levels (between 200mg/dl – 259mg/dl). In other words, when you reduce your body’s healing antioxidant substrate, you incur a higher chance of dying from all other causes. 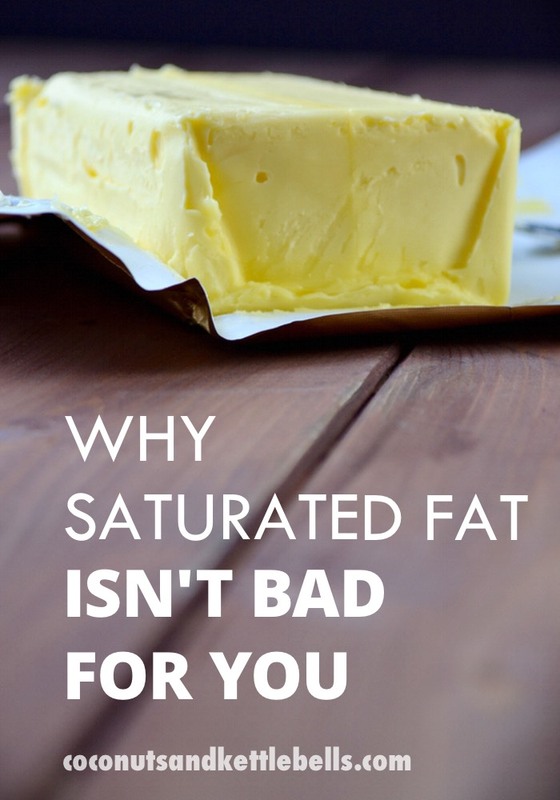 So, is saturated fat bad for you? When not lumped together with man-made frankenfats (also known as trans fats), long-term studies show little association between elevated cholesterol levels and intake of saturated fat. And if you’re wondering if saturated fat “clogs arteries” and causes disease in some other way outside “raising” cholesterol levels, recent studies, including a large meta-analysis published in 2010 reveal no association between saturated fat and heart disease. But don’t get it twisted, consuming processed sources of saturated fat (I’m talking to you, hot dogs fans) will increase your risk of experiencing multiple diseases, so go with quality, local sources of saturated fat like grass-fed meats, butter, and pasture-raised eggs and pork produced by your local farmer. And duuh, eat coconut oil. Will We Ever See a Better Life? 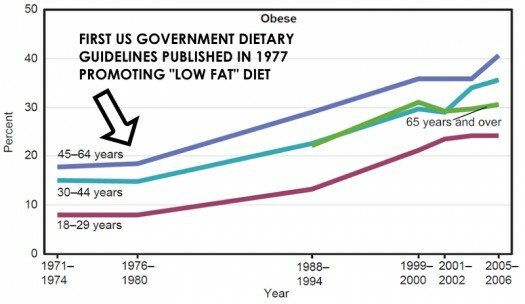 While the wheels of the cholesterol and saturated fat theory are finally coming off, mainstream education from our government will continue to be driven by the food industry, making “low-fat” and “cholesterol-free” foods like diet coke, fruity pebbles and frozen yogurt sealed with the AHA’s lucrative “heart healthy” stamp the recommended choice for moms. Perhaps the biggest giant in the low-cholesterol game is the $29 billion dollar statin drug industry, who will continue to spend countless dollars for studies “proving” the efficacy of their product and selling the idea to medical doctors that it’s the “solution” to heart disease. And no, I do not own a Ph.D.
Folks, I’m not a doctor. With that, please note that I am not suggesting or encouraging anyone who is on a statin drug to come off of it. Statin drugs have been show to prevent death in those who already are suffering from heart disease. Coming off statin drugs (or any drug) is a decision that MUST be made with the help of your doctor. Please read my disclaimer for more info. 6. M Enig, Know Your Fats: The Complete Primer for Understanding the Nutrition of Fats, Oils and Cholesterol Silver Springs: Bethesda Press, 2000. Print. There are two major differences in people’s lifestyles between 1900 and 2000. What we eat, and what we do. Almost all labor, all jobs, were fundamentally physical in the early part of the 20th century. That changed after the second world war, and the change accelerated further through the last half of the 20th century. Now most people work by sitting. All day. And grumble when they have to walk ALL THE WAY to the restroom. We walk less, we sit more. Heck, even farming has become a relatively sedentary occupation, at least compared to what a farmer in 1900 did. Both changes are profoundly important. What you are eating is very important. When you are physically working all day, you’re burning the calories. Today, not so much. Look at people who eschew modern conveniences, like the Amish. When you plow your fields with a team of horses or oxen, your effort level is very different than when you’re riding a Deere. And the Amish seem to be much healthier than we “modern men”. I’m not suggesting we can put the genie back in the bottle, just that the impacts of that change should not be ignored. Hi Mike! I SO appreciated your perspective! Rest assured this very profound reality is not ignored. 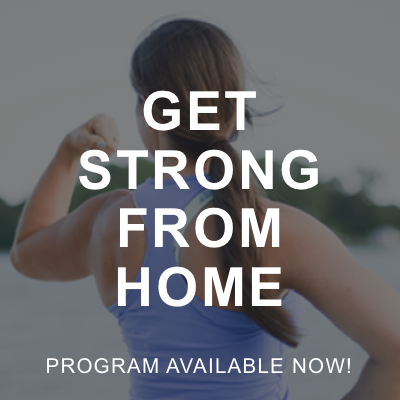 I will definitely be covering some information about what does reduce your risk of heart disease – however, this was an area to address the myths related to saturated fat, and specifically, elevated cholesterol. There is no question exercise levels have changed significantly. While exercise does reduce the risk of heart disease, the lack thereof has not been found to be the root “cause” of heart disease. As an example, there are quite a few very healthy, active people who die from heart attacks and experience chronic illnesses like cancer and heart disease like my grandfather who was a strong, active farmer and was taken from the earth far before he should have. It’s such an important part of the picture – but the drastic changes in overall food quality and availability of processed sugar, grain, and vegetable oil product is, from my perspective, a bigger piece of the pie. Thank you for your thoughts! What amazing article. I really enjoyed the history part. Sharing. Hi Noelle! Just finished reading the article and I wanted to say thank you for it! You managed to put a topic that is close to my heart but also hard to get the head around into a clear, concise, story format that was so easy to read! Never thought I’d enjoy reading about saturated fat so much lol! Thank you for your work!! Thank you for yet another great post full of great research and background which I think is highly enlightening. I’m curious about butter. Though I know it’s a “super food”, I’m just not able to eat it and feel well. I either get a stuffy nose or break out every time I have even a little bit of it. I’ve been dairy free for 11 years and though everything I read says that butter is the exception, it doesn’t seem to be for me. I’ve tried ghee as well and get the same reaction. I’m curious if you’ve seen this in others. Finally, is there a way to get email alerts of your blog posts? I am confused because polyunsaturated oils are rich in Omega-3 and fatty acids which are often associated with positive health benefits. But your final statements concludes that this is what scientist are saying causes heart disease. I’m a bit confused now? Please help me understand. Hi Natalie! Great question. 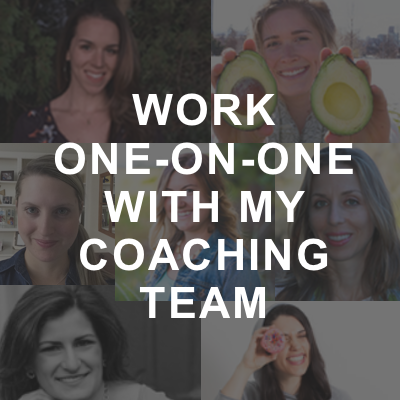 You’ll notice I said “oxidized” polyunsaturated oils and cholesterol – which means, fats that are damaged as a result of high heat, lengthy air exposure, or food processing. Polyunsaturated fats are incredibly unstable, so they’re best consumed in their whole food form. So, if you’re looking for Omega-3s, you’d want to consume fish, like salmon and sardines, in their whole form and lightly cooked. Other sources of polyunsaturated fats, like nuts and seeds, are best consumed not exposed to high heat roasting, or processing. Hope that helps a bit! Yes this helps clarify things for me. I have the O2 diet book from a few years ago which supports your explanation too. I really liked the historical perspective you took in the article. Thanks for all the info! SACN (a UK government panel) recently looked at the data surrounding sat fat, and its effects on health, and they found a few results that contradict what you said above. They conclude that there is adequete evidence that a reduction in dietary sat fat does lower serum cholesterol, and that replacing sat fat with PUFAs lowers the risk of CVD and CHD. Its a fairly comprehensive report, fully referenced, with clear quality criteria for explaining which reports they include in the analysis and why. Just wondering if you had read it? There are some quite interesting findings. Hi Geoff! I haven’t, but there has been quite a bit of research (like you’ve mentioned) for decades. I’m guessing what you’re referencing doesn’t look at any new literature, it’s more of a “review” of the older literature. Things to consider: Are they largely observational studies based on “recall” data? Does it take into account quality of fats/oils and their source? 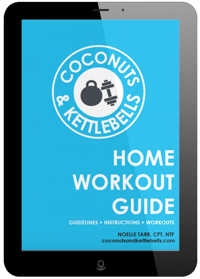 Does it lump together hydrogenated oils with natural saturated fats, like coconut oil? What about confounding variables (people who eat less saturated fat are also likely to pursue other healthy behaviors, such as exercise). Personally, there hasn’t been any new literature that has shown anything other than what I’ve detailed above. Thanks for looking into it and sharing! I find it strange that you reference the Siri-Tarino et al paper, as the accompanying editorial in the journal it was published in was quite critical of the way that it was put together. The SACN review considered all evidence, limited to RCTs, PCSs or reviews of these. The key seems to be the Cochrane systematic review conducted by Hooper et al (2015). 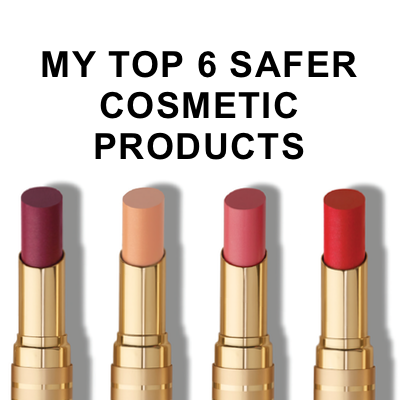 This reviewed all of the same evidence that Siri-Tarino considered, and more. It came to the conclusion that A reduction in sat fat reduced the risk of CVD events by 17%. I can’t say whether this distinguished between trans or natural sat fat. You talk about recall data in your reply, do you consider this a bad thing? The paper you refence uses recalled data. The fact that you seem quite closed to the possibility of new data confounding your opinions is quite strange, especially as you quite a paper that is 9 years old, and there have been many reviews published since that show different results to a criticized review. The source of fat is important, trans fats are deadly and the steps being taken to remove them from diets globally is great, but the bulk of the evidence suggests that replacing sat fat with PUFAs will lower the risk of developing CVD. You seem to have cherry picked a review by authors with a potential conflict of interest, that has 12 points of contention that were picked out by the editor of the very journal it was published in. Perhaps you should review all of the data with a more critical eye, and give the SACN report a read. It’s pretty comprehensive in the data it considers, and quite strict quality control too. Thanks for sharing your opinion—we definitely have different interpretations of the data. Well when you cherry pick a widely criticized paper to build your case, its hardly surprising that you have a different view to a large, widely ranging review that considered ALL the evidence. Disagreeing with a Cochrane review (and a review that considered it, and many other sources) is one thing, not being able to say why, or present any real evidence to the contrary (that wasn’t considered in the review itself) is another. I`d be interested to understand you interpretation of the wider data set, including studies that show sat fat does have a negative impact on the chances of suffering from CVD or CHD. Cherry picking studies is rife in science, and all parties are guilty of it, hence the power that Cochrane reviews have, where they consider all the data. I would think, in order to have a full and open discussion on what is a complex topic, it would be important to consider all the data in an article, and use your abilities to analyse the data/outcomes, rather than just ignore them. Do you agree?